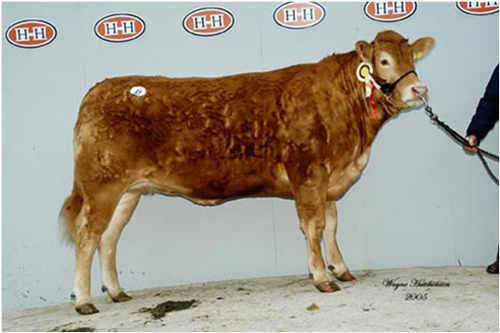 Sherry Uricka was purchased from Carlisle sale May 2005, where on the day, she stood as Overall Female Champion and sold for the day’s joint top price of 3,000gns. She is a powerful daughter of Jockey and is out of Sherry Liquor. We have embryo calves on the ground from Sherry Uricka, a heifer by Samy (Elderberry Elsa) and a bull by Wilodge Vantastic (Elderberry East Yorkshireman). She has a calf at foot, (Elderberry English Rose) a heifer calf by Wilodge Vantastic who is looking terrific. Now in-calf to Milbrook Alistair for January 2011.